For the first time in a long time I was not able to get out and take some photos last week. So, instead, I looked back in the archives and came upon one of my favorites from Walt Disney World. Surprised? 🙂 I took this back in 2007 when I was still learning how to use the Nikon D70. I was riding the Tomorrowland Transportation Authority, or WEDway Peoplemover to any old timer Disney park goers out there, when I took this. To see a before and after of this photo, visit the Picture This! article I did recently called Back to the Future where I explain how I created this image from the original. Oh, this version is different from the after version in the article. Can you tell me how? Castle at Dusk. Cinderella Castle taken from the Tomorrowland Transportation Authority in the Magic Kingdom, Walt Disney World, Orlando, Florida. 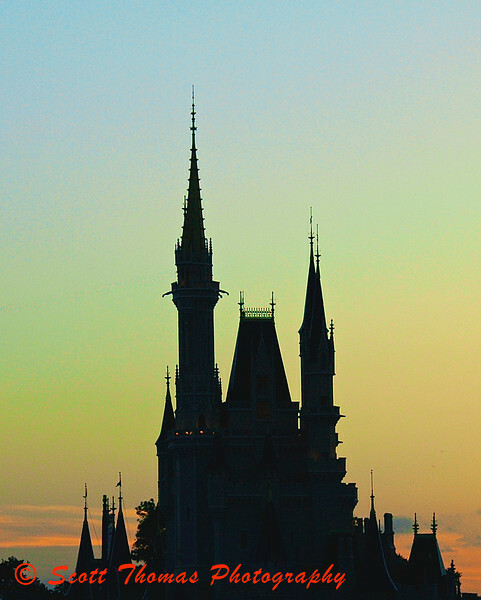 This entry was posted in Travel, Weekly View and tagged aperture 2, apple, castle, cinderella, colors, dusk, florida, orlando, Photography, silhouette, sunset, walt disney world. Bookmark the permalink. Beautiful silhouette! I really like the sky here, too. Only difference I found between the two “afters” was the wire (?) you cloned out in this version. Good move! Yep, that was it. The gang at The Magic in Pixels (see link under my Favorite Blogs list) urged me to remove it. I used the Repair tool in Apple’s Aperture 2 software which also got rid of the sensor dust from the original, too. Aw nuts, dailyclick beat me to it. It is a great image, but I have to say it seems brooding to me, as if the occupants bear watching. Probably comes of spending too much time at Hogwarts. On the other hand, they’re up to something in the tower where the windows gleam . . .
LOL…wrong themepark, Gerry! This is a Princess castle. I you did not tell about the post-pressing thing, I believe this is from a fairyland. Thanks, Tabib! Nice bird and flower shots on your blog far from my temperate upstate NY. I love the twilight, and this fantastic silhuette, realy shows how it can be used to underline a sentiment. I was amazed at all the colors I was able to find and enhance, Birgitte.